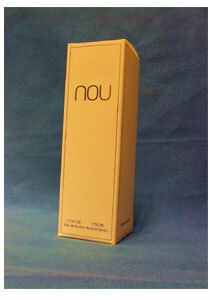 There is one review of NOU. Knowing that Claude Dir is responsible for this concoction, I expected a more juvenile, casual scent. Then again, I'm a sucker for iris. The first time I put it on I could barely smell it, and I will take into account a little olfactory fatigue that day. The second wearing confirms that this is subtle, and not for those who like their perfume to announce them from fifty yards (shame on them!). I notice the orris and vanilla orchid most, combined with a hint of new casmere scarf. Not the most well rounded thing I've worn, but I find the powdery, buttery iris goodness balanced nicely. Seems to have some longevity. All in all not bad: still feels casual (I suppose "no underwear" is casual), and I'm not sure it's worth the price. The good news is they claim no artificial ingredients or coloring. Yay. There are no member images of NOU yet. Why not be the first?